Cool temperatures and crisp mornings have descended on Barcelona. With the coming of fall, the city is alive with a variety of cultural events this November. Take a read below to discover some of the most interesting things you can do in Barcelona in November. The finest examples of photojournalism in the world are on display at the 57th annual World Press Photo exhibition at the Centre de Cultura Contemporania de Barcelona (CCCB), Barcelona’s contemporary art museum. The exhibition is in Barcelona until the first week of December. It features winning photographs from the World Press Photo contest which took place this past year. A panel of judges selected winning photographs for nine different categories. There are 53 winners from 25 nationalities. 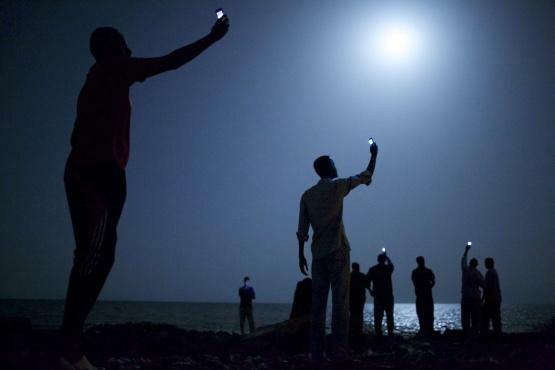 Photographer John Stanmeyer won the World Press Photo of the Year award for his photograph of African migrants standing on a Djibouti beach holding their phones up in the air to capture cheap cell phone signals from Ethiopia. The exhibition is open from 11 a.m. to 8 p.m. Tuesday, Wednesday, Friday, Saturday and Sunday; and from 11 a.m. to 10 p.m. on Thursday. Entrance to the event is 6€ for the exhibit and is free for visitors 16-years-old and younger. Click here for more information about the 2014 World Press Photo exhibit in Barcelona. Click here for a list of winners on display at Barcelona’s 2014 World Press Photo exhibit. Duncan was a photographer who capture through photographs the life of famed Spanish painter Pablo Picasso. Duncan’s first photo exhibit at the Picasso Museum took place as part of a celebration of the museum’s 50th anniversary. The museum only exhibited half of Duncan’s works. This year, the artist decided to donate the second half of his Picasso collection to the museum. Duncan, a war photojournalist, first met Picasso in 1956. According to the Picasso Museum’s website, that first meeting sparked a friendship. Of particular interest is the way the museum has displayed photos of Picasso painting works alongside the actual paintings he was working on. The experience is one you should not miss, particularly because the exhibition gives us a glimpse into the daily life of one of the world’s most famous artists. The photo exhibit is part of the overall museum collection and therefore is available to view during the museum’s normal business hours. The museum is free after 3 p.m. every Sunday. Click here to read more about David Douglas Duncan’s exhibit at the Picasso Museum.